Our shipping integration with FedEx and UPS enables you to obtain real-time shipping quotes from your carriers. QuoteWerks has a shipping rate integration with FedEx and UPS enabling you to obtain real-time shipping quotes from your carriers. Use it to calculate your shipping costs, mark them up and pass them through to your customer. Choose from a grid of available services and pricing like Ground, Overnight, Two day, etc. 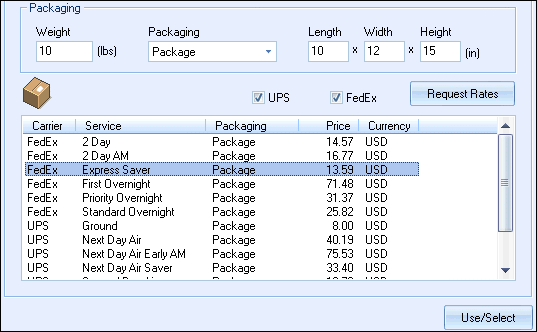 You can also easily give your customers shipping option choices (complete with pricing) such as Ground, Overnight, etc. The shipping integration with FedEx and UPS Requires the QuoteWerks Real-time Module.